I didn’t get a chance to talk about it much here, but The Conjuring was quite possibly my favorite movie of this past summer. As someone who does not typically consider himself a horror fan, The Conjuring hit all the right notes for me. It had a good setup that paid off through the rest of the film; it had strong characters that were worth caring about (rather than the all-too-typical disposable fodder found in other horror films; it had a great classical sensibility to its scares, taking cues from the likes of The Exorcist and even The Shining without feeling derivative; and, best of all, it had an impeccable sense of pacing and tone that kept the movie engaging and frightening from beginning to end. 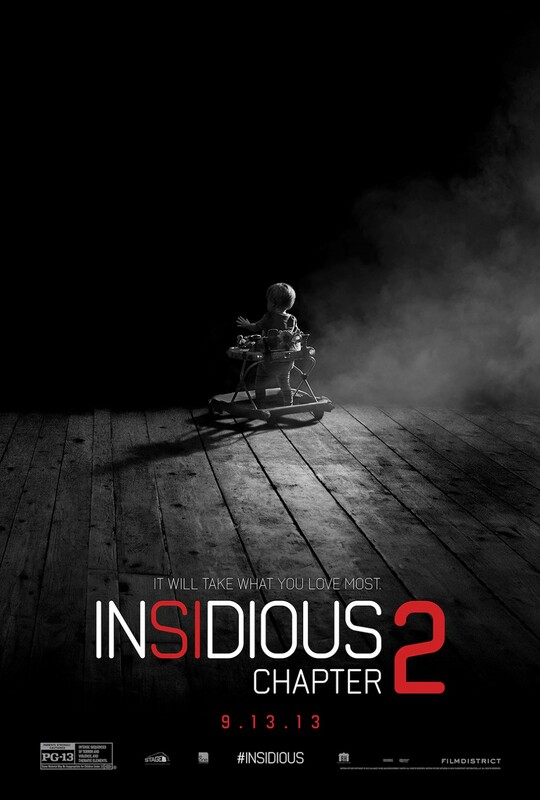 Despite not being familiar with director James Wan’s work as a whole (I tried to remedy this problem, but I had a difficult time finding his other films available for rental), I couldn’t help but be a little bit excited for Insidious: Chapter 2 after enjoying The Conjuring as much as I did. Sadly, Insidious: Chapter 2 not only fails to reach the same heights that Wan achieved in The Conjuring, but also struggles to clear the decidedly lower bar held by the original Insidious. Fair warning: while I won’t spoil any major reveals from Insidious: Chapter 2, it’s essentially impossible to talk about the sequel without spoiling the previous film. If you haven’t seen 2011’s Insidious and don’t want it spoiled, here is your door out. Anyway, the film really isn’t kidding around with the Chapter 2 bit; this movie – after a quick flashback prologue – begins exactly the moment the previous film left off. Dalton has been returned to his body after his dad rescued him from the land of the dead, but dad himself never made it back to his body. Instead, the soul of a deceased woman who has been haunting him since childhood takes possession of Josh’s “vessel” and strangles Elise, the paranormal savant who helped Josh bring his son’s consciousness back to his body. As you might expect, this leads to a problem common with most “part 2” movies, namely that the film doesn’t really have a beginning. I saw both films in a double feature (each for the very first time), and that really feels like the best way to see this. There’s no lead-in or build up to the action of the film, instead the movie throws us almost instantly into the ghosts and paranormal occurrences that the previous movie spent half of its run time working its way up to. From a narrative standpoint this makes a certain amount of sense – it’d be tiresome to go through the same beats as the previous film – but from a pacing standpoint the tension present in the movie peaks early on, meaning that the rest of the film can’t help but lose a bit of steam as it goes on. To try to offset this, the film ends up being much more driven by the mystery of Josh’s possession rather than the actual haunting. The problem there, though, is that we already understand the basics of his possession, in fact we have since the end of the previous film. So we’re left with the frustrating experience of spending half the movie watching the characters catch up to what we’ve known since before the opening credits rolled. Of particular annoyance is the fact that Renai (Josh’s wife) should, by all accounts, already be clued in to what’s going on. She saw the picture of the old woman, and she clearly suspected Josh wasn’t quite there at the end of the previous film, so why is she suddenly trusting of him? Sure, there’s probably a reasonable level of doubt that could be expected, and she’s probably hesitant to believe her husband is possessed, but once the haunting starts right back up (which, as we’ve established, it does almost instantly) that should confirm any suspicions she had. Instead, it’s Lorraine – Josh’s mom – who does most of the heavy lifting in terms of realizing what’s actually wrong while Renai futzes around being helpless. Normally, this kind of inconsistency and general lack of common sense would be par for the course in a horror film, and I can deal with a fair amount of silliness for the sake of the story. However, the fact that this is so closely tied to the conclusion of the last film, and plays directly into revelations made mere days ago as far as the story is concerned undercuts a certain amount of character development and makes the whole thing rather disappointing. If you’re going to do a sequel that picks up right where the last film left off, the audience will expect a certain amount of growth from the characters, and in the case of Renai, it just doesn’t exist in this film. I also mentioned the fact that a good chunk of this film is spent investigating the mystery behind Josh’s possession, and while a lot of this ends up being more interesting than the haunting taking place at the Lambert home, it has the unfortunate side effect of making things feel fragmented. Renai and her happy haunts feel a bit like an afterthought, and whenever the movie shifts away from them it acts as though that whole side story is suspended in time until we get a chance to check in. Nothing seems to happen in between these scenes, making it lose a sense of reality. In addition, there’s concepts in the film that are introduced, but never play out in any noteworthy way. There’s parts of the narrative, especially later on, that feel like artifacts of an older version of the screenplay that are now orphaned in the middle of the current version. That said, the film isn’t all bad. There’s a few aspects to it that are effective, and even quite clever. The main antagonist of the film is sufficiently creepy, and the investigations the characters make into her backstory are rich in atmosphere and sometimes even quite frightening. There’s a trio of characters who end up together in the last half of the film that make a fun team, and when the movie starts borrowing a page from Back to the Future Part II I was surprised by how well it was implemented in the context of the film (though I fear it could retroactively hurt some of what was done in the first movie). Another thing to note, is that this movie has a very distinct shot-on-video feel. The staging and the shot construction itself is handled very well, but the ugly digital sheen that coats the whole movie doesn’t do it any favors. It makes sense, given how closely tied the two films are, that they would want them to have a seamless aesthetic, but this was one flaw of the first I would have been happy to see fixed in the second. That said, I’ll gladly take ugly, but well-staged, digital photography over found-footage style point-of-view – a style which, unfortunately, is awkwardly shoe-horned into a few scenes of the film. Much like the first Insidious, Chapter 2 is a mixed bag. Sadly, this time around the bag contains more bad than good. As far as horror sequels go, this is more successful than most by managing to actually be watchable while competently expanding on ideas from the first film without being a total retread. That said, it’s still a disappointing sequel to a film I didn’t love to begin with. Unless you were head-over-heels in love with the first film and are desperate to know what happened after that cliffhanger, I’d recommend passing on this one. Instead, if you haven’t yet seen it, go see Wan’s other 2013 haunted house movie The Conjuring. It’s interesting, both films deal with some similar themes, and share some common elements, but the execution on The Conjuring is so much better than what is done with Insidious: Chapter 2. Who knows how the productions actually went, but comparing the two, it really does feel like The Conjuring got the lion’s share of Wan’s attention, while Insidious: Chapter 2 was relegated to the status of b-project.